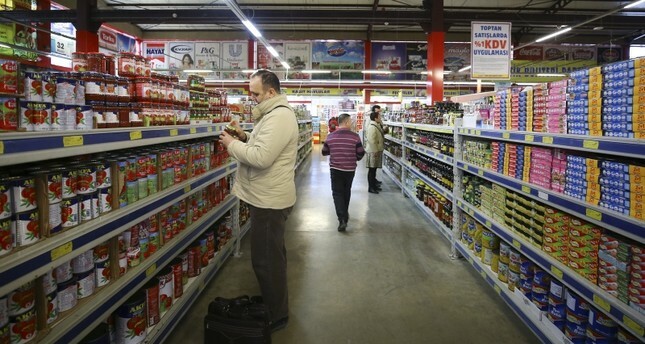 Consumer prices in Turkey rose by 20.35 percent year-on-year in January, the Turkish Statistical Institute (TurkStat) reported yesterday. The country's annual inflation went up 0.05 percentage points from 20.3 percent in December 2018. Economists also forecast that Turkey's year-end annual inflation will be 16.38 percent on average, with predictions varying between 13.50 and 19.80 percent. On a monthly basis, the consumer prices climbed 1.06 percent in January. "The highest monthly increase was 6.43 percent in food and non-alcoholic beverages," TurkStat said. "The highest monthly decrease was 7.95 percent in clothing and footwear." Official figures revealed that the 12-month average hike in consumer prices was 17.16 percent as of this January. The Central Bank of the Republic of Turkey (CBRT) during last week's presentation of its first quarterly inflation report this year said it is determined to maintain its tight monetary stance until a convincing decline in inflation is seen and will deliver further tightening if necessary. The bank revised its inflation forecasts down to 14.6 percent for this year from 15.2 percent in its previous report. The bank projects that inflation will fall to 8.2 percent at the end of 2020 and 5.4 percent at the end of 2021, before stabilizing around 5 percent over the medium term. Jason Tuvey, senior emerging markets economist at London-based Capital Economics, was cited by Agence France-Presse (AFP) as saying in a note that inflation was expected to ease over the coming months. The CBRT has left its policy rate unchanged since September when it hiked 6.25 percentage points to 24 percent. It lastly decided to keep its benchmark one-week repo interest rate constant at 24 percent on Jan. 16. As noted in Turkey's New Economic Program (NEP) announced in September 2018, the country's inflation rate target is 15.9 percent this year, 9.8 percent next year, and 6.0 percent in 2021. Economists pointed particularly to the high increase in the food prices, which accordingly had the biggest effect on the annual increase. They also remarked that last month's heavy rain and rare tornado in the southern city of Antalya have seriously damaged many cultivated fresh vegetable and fruit greenhouses and farms and that the situation has brought along harsh increases in prices. Besides tourism, Antalya is one of the most significant agricultural provinces of Turkey, and has significant fruit and vegetable exports.